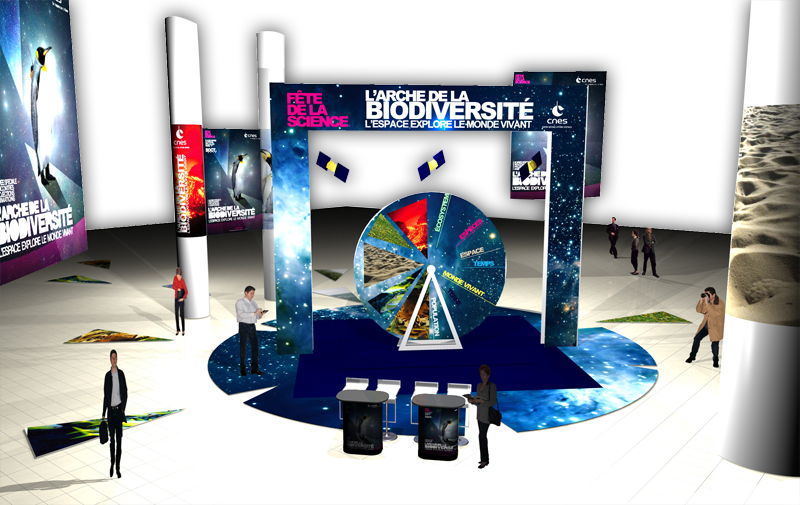 As part of the International Year of Biodiversity (IYB), CNES will be celebrating science at the Forum des Halles, Paris, from 20 to 24 October. Space experts, explorers, art and interaction with the public will be on the menu. CNES is setting up stall at the Forum des Halles, Paris, from 20-24 October. Credits: CNES/Ill. Mediatec Diffusion. 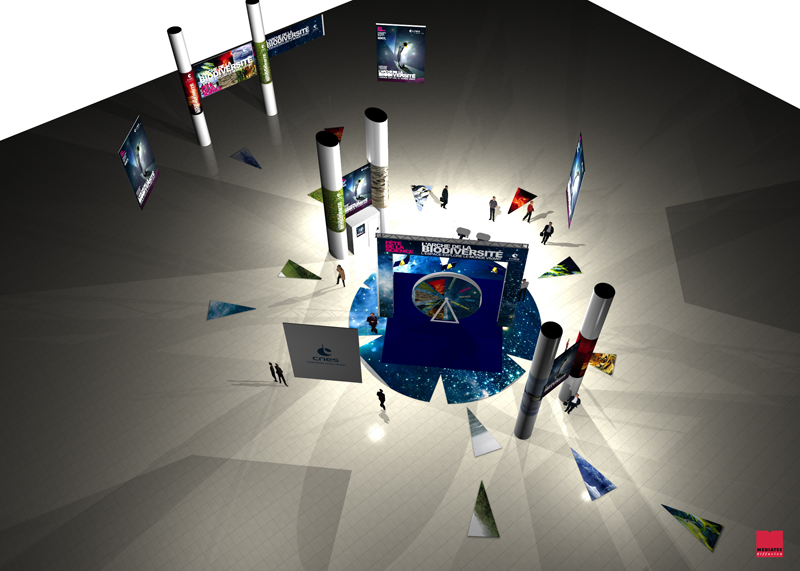 CNES will be at the Forum des Halles, Paris, for a 2010 Science Week focused on the living world. The “biodiversity ark” will be setting up from 20-24 October in Place Carrée, at the heart of Paris in France’s busiest shopping centre. For 4 days, the public will be able to mix with specialists at a range of events organized by CNES. And in the middle of the “ark”, a compere will be regularly spinning the big “Wheel of Questions” between 12.00-2.00 p.m. and 5.00-7.00 p.m. The wheel will have 16 compartments for 16 topics related to space and biodiversity: the environment, wildlife, pollution, human activities, launchers and satellites, exploration, origins of life, French Guiana, space bases, astronauts, water, deserts, oceans, ice, climate and air. Also, every afternoon between 2.00-5.00 p.m., graffiti artists from the Parisian art school e-artsup will be performing on the back of the big wheel. The Biodiversity Ark, at the heart of the Forum des Halles in Paris, will provide a focal point for visitors and specialists to get together. Credits: CNES/Mediatec Diffusion. The evening will be hosted by journalist Vincent Perrot. Credits: RTL. To launch 2010 Science Week in Paris, CNES is inviting members of the public on Wednesday 20 October at 8.00 p.m. to an evening at the Forum des Images, in the Forum des Halles. Journalist Vincent Perrot will be hosting this evening on the theme of “space, the explorers’ companion”, alongside explorers, astronauts and researchers who will be sharing accounts of their experiences and showing stunning pictures of their expeditions. And to ensure that space culture reaches the widest possible audience, this year CNES will have sign-language translators at the opening evening at the Forum des Images and throughout the 5 days of Science Week in Place Carrée. CNES’s space centres in Evry, Toulouse and Kourou will also be taking part in the programme of events put together for 2010 Science Week.